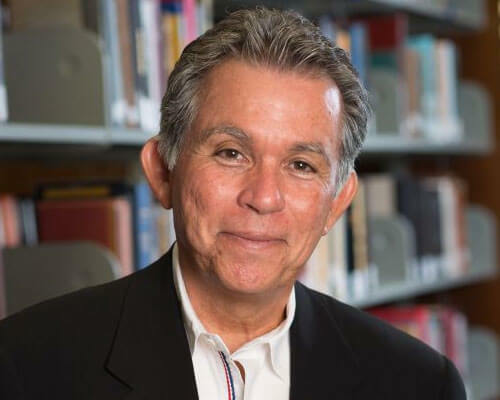 Home » Academics » Schools » College of Arts, Humanities and Social Sciences » Faculty » Armando Abney, Ph.D.
Armando J. Abney, Ph.D., has been teaching at St. Mary’s University for more than 20 years. Prior to joining St. Mary’s, he was a research methodologist for the Texas Department of Mental Health in Austin. He truly believes in the values of a Catholic, Marianist and liberal arts education. He came to St. Mary’s University because he believes what the University and a Catholic education stand for, namely the emphasis on giving back to others and improving the lives of those in your surrounding community. Inspired by his own professors, Abney keeps students motivated by connecting them with meaningful research topics and guiding them toward a deep understanding of the material so that they can apply what they learn to the real world. He teaches courses in stratification, criminology and research methods, where students gain an understanding, come to the realization, if they haven’t already done so, of how our social class background shapes our lives in no small measure. His students also gain an understanding of the scientific method, not just as an academic research skill, but as a problem solving skill they can employ in their professional lives. Abney believes education and learning is a two way process and wants each of his students to come away with knowing how the influences in our culture and our society shape people’s lives, including our own. He also wants every scholar to realize that learning and education is a life-long process. He is the faculty sponsor for Alpha Phi Sigma, the National Criminal Justice Honor Society, and works with student researchers through the St. Mary’s University McNair Scholars Program. When he is not in the classroom or sponsoring student organizations, he enjoys running, hiking and playing tennis. Internship in Criminal Justice & Criminology: Building Professionalism through Theory & Practice. (Forthcoming). Kendall-Hall Publishing. Daniel Rigney, J. Matz, and Armando J. Abney, 2004. Is There a Catholic Sharing Ethic? : A Research Note, Sociology of Religion: A Quarterly Review Summer, 155-165. Armando J. Abney and Monica Henriquez Gochez, 1994. “Criminal Victimization Among College Students: A Descriptive Analysis”, American Society of Business and Behavioral Sciences Perspectives Journal 1(2), 139-149. Arce, Carlos H., and Armando J. Abney, 1992. “Regional Differences in Chicano Intermarriage”, La Red/The Net: Newsletter of the National Chicano Council on Higher Education 52:2-3. Published by the National Chicano Research Network, University of Michigan, Ann Arbor, Michigan. Armando J. Abney and Judith A. Warner, 1989. “School Policies and Environment as Influencing Factors in the Transition from Primary to Secondary Deviance Among Mexican American Youth”, National Social Science Journal 6:65-76. Arce, Carlos H., and Armando J. Abney, 1982. “Demographic and Cultural Correlates of Chicano Intermarriage”, California Sociologist 5:41-57. Abney is currently conducting research on crime trends for the over 50 population in the US. Criminological research suggests that after the age of 30 people cease their anti social behavior. Abney’s research looks at the increasing crime committed by the over 50 population, that according to the available data, is much higher than at any time in history. He is also starting research on the impact of the oil boom in rural counties in south Texas and the increase in crime in those locales.